Buying the right type of heating and cooling solution for your office or home is usually a highly complicated task largely due to the many factors that come into play. Before making the final buying decision, you need to consider the size and division of your home or office rooms, budget, age of building and the type of technology among other installation considerations. 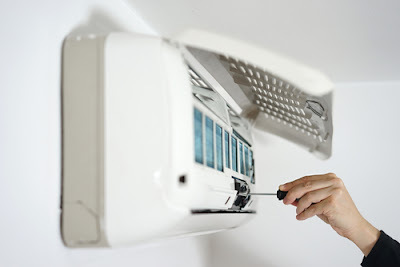 The process of finding the ideal heating and cooling system is complicated by the fact that there is no single unit in the market that is suitable for every room. For some homes and buildings, VRV systems could be the most efficient system while for others, split units could be well suited. To choose the right system between a VRV system and split units, you must thoroughly consider the pros and cons of each system as compared with your heating and cooling needs. To help you make the right decision, this article will help explain how each system works and the benefits you will enjoy for installing these emerging heating and cooling solutions. Variable refrigerant volume commonly referred to as VRV is a popular air-conditioning system designed and developed by Daikin over 30 years ago for commercial building application with advanced individual zone control to effectively and efficiently control your building’s climate system. Over the years, the VRV systems have been updated to offer greater energy efficiency and provide an all-around climate solution for a wider range of applications. The VRV system was the first unit in the market with variable refrigerant flow control in the world. The system uses heat pump and inverter technology to continuously adjust the system refrigerant amount to help significantly save on energy while offering accurate control for optimum comfort. Some of the main highlights that helped market VRV systems include the waterless operation, energy saving features and absolute flexibility. The new VRV systems are also designed to offer significant benefits to installers, engineers and homeowners by enhancing building comfort and integration of new technology developments for further energy savings. - Independent Control: The VRV system enables zones on the same floor or different floors to have independent air conditioning control by automatically controlling each unit to offer different sized rooms with suitable environment for working or living. - Cost Savings: The VRV system allows each zone to be controlled independently resulting in low running costs. Unlike other systems, the VRV solution makes it possible to only heat or cool the specific rooms that need air conditioning while being completely shut down in the rooms that does not require air conditioning. 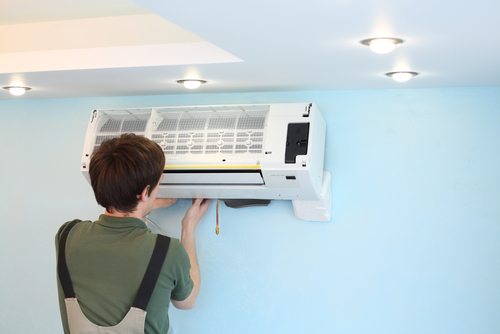 Furthermore, the total load for specific units can be adjusted based on the specific air conditioning needs. The independent control lets you save resources by only using the system in rooms where conditioning is needed. As a result of continuous innovation, the current generation of VRV systems is fitted with superior technology to offer amazing capabilities. - Using the heat recovery technology, the latest systems have the capability to reuse heat from various rooms such as the server and offices to heat other areas, heat applications and warm water as per your needs. - Featuring the variable refrigerant temperature, the VRV system can continuously adjust the refrigerant temperature to match the actual capacity and temperature needed at all times for maximum seasonal efficiency. - Using the more reliable compressor, the VRV system can increase compression volume by up to 50 percent. The split system consists of two operating components that include the fan and the evaporator. The system is wall-mounted inside a building while the compressor unit is fitted outside the building on the ground or hung on the wall. The split units work by extracting humidity and hot air inside a building and remove them using the compressor. To heat your home, the units extract cold air and blow warm air around the building. 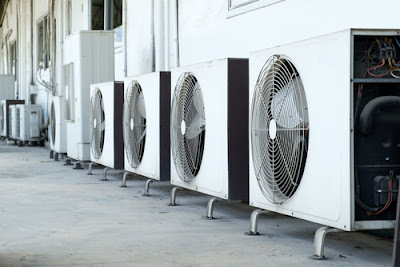 The system has an internal thermostat that detects warm air to activate the outdoor compressor that circulates the refrigerant gas increasing the temperature and pressure as it passes through the pipes to the condenser for further processing. Once in the condenser, the gas changes into chilled liquid that is pushed indoors to the evaporator system. In the evaporator system, the warm air is passed through the pipe containing the chilled refrigerant for cooling before it is blown back into the room by the fan system. The process will continue until the unit stops detecting warmer air than desired. - Targeted heating and cooling: With the split units, you can install an installer and a fan in every room and run them independently using only one outdoor compressor for efficient and convenient heating. - Long term costs savings: Although the system requires electrical wiring and specialized installation techniques, homeowners find it as a cheap, energy-efficient way of precisely controlling heat in the home thanks to its compact design that is easy to operate and maintain. - Air Purification: Some split units are fitted with air purifying features to help prevent dust and allergens from circulating in the building. If you are trying to choose between the VRV system and the split units, you need to consider the effectiveness and suitability of the units in relation to your cooling needs. The split unit is a suitable solution if you are looking for a unit that offers the convenience of central air with the efficiency and customization of a space fan or heater. The split units have a larger compressor than window units enabling them to cool larger areas. The VRV system is suitable if you are looking for a single system that integrates cooling, heating, hot water and ventilation with an advanced temperature control solution that is suitable for any sized buildings. Furthermore, the VRV system is suitable if you are looking for a unit that offers enormous energy saving with increased flexibility.